My Domestic Monastery: The Grace of Enough Book Tour!! 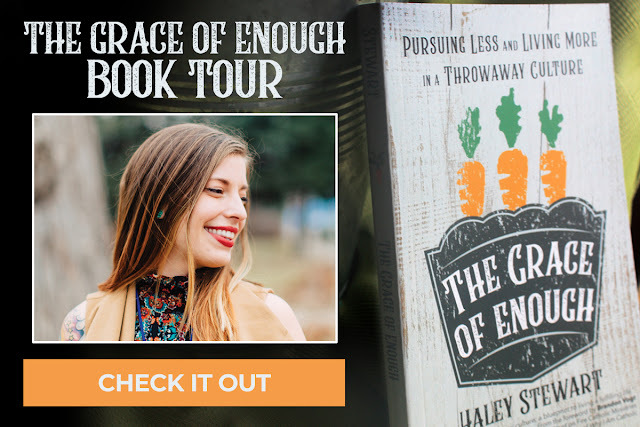 The Grace of Enough Book Tour!! 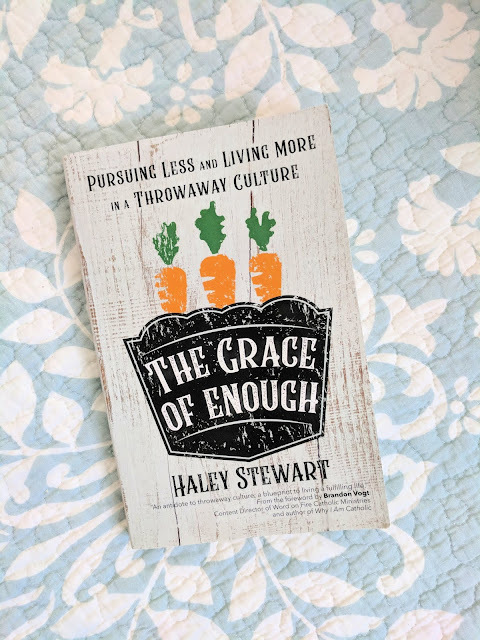 When my lovely friend, Haley Stewart, invited me to join the online Book Tour for her new book The Grace of Enough, I said yes in a heartbeat. When it comes to Catholic books, I am a total book snob. Having studied theology in undergrad and grad school, I have read a lot about the Catholic faith. Sometimes, I try to pick up a Catholic book, but I just feel like the author is saying stuff that I've already heard and it's not making me grow. You guys...this book isn't like that. I feel like this book came to me at just the right time, which is usually due to some nudging from the Holy Spirit. For the first seven years of our marriage, one or both of us was in grad school and our budget was super tight. Our two family charisms are hospitality and generosity (or, at least, those are the charisms we're trying to develop in our marriage), but despite that...I still felt a need to acquire a lot of stuff. It wasn't that I was spending a lot of money, but I would go to a rummage sale and come back with a box of stuff. I just felt like I needed so much, and because we didn't have a ton of money, I felt like, if I saw something for cheap I had to buy it (in case I needed it later). Other times, I would go out on Saturday mornings, after a week of taking care of itty bitty kids, and just want to feel like I accomplished something. So, I would spend $10 on a box of potentially useful stuff and momentarily feel really good about myself. Needless to say, that feeling didn't last forever. When we moved to our new house a couple of years ago, we got rid of a ton of stuff, but I still held on to so much. The past year or so has been a process of letting go of more...but I still felt like I could be doing more. I still felt overwhelmed by the amount of stuff we had. 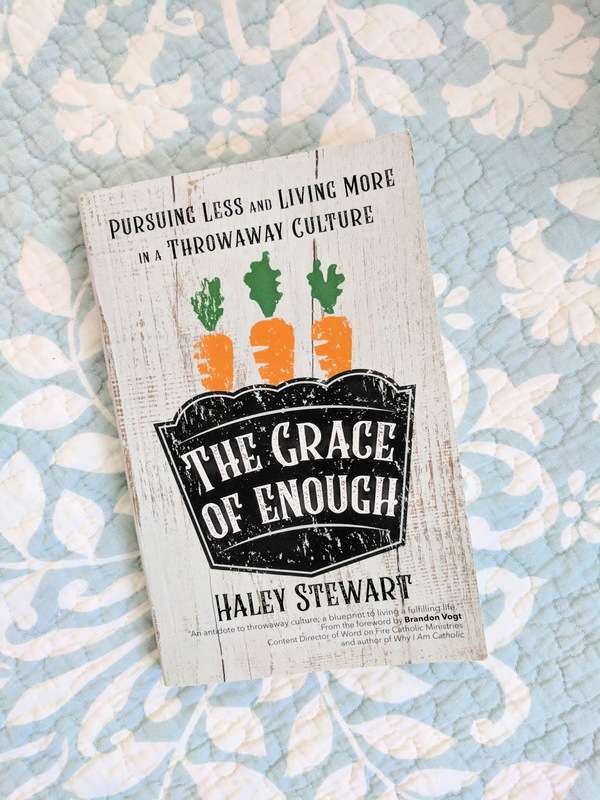 I've only had Haley's book for a little while, but her message (gently given, in the context of her own family's story) was exactly what I needed to hear right now. I don't spend a ton of money on stuff, but I definitely know the feeling of satisfaction when you think you've bought the perfect thing that will make you happy forever. (I loved Haley's story about her "perfect" computer bag, and I could totally relate to it.) But I know that, too much, I cling to the temporary satisfaction that I can get from stuff. Their story is so beautiful and it resonated so deeply with me, because Andrew and I did the crazy thing (i.e. 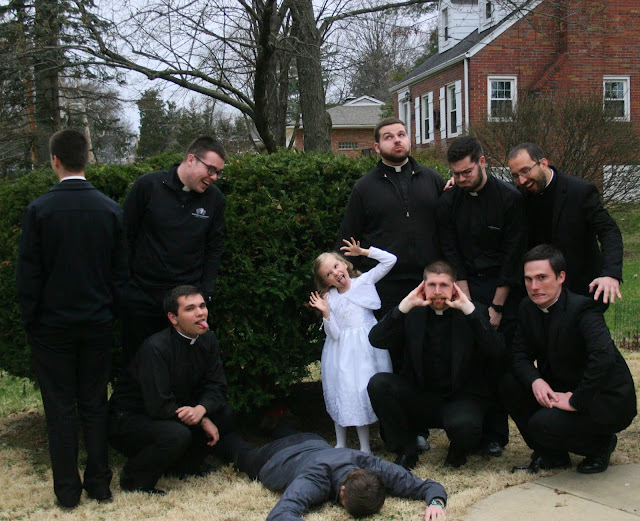 get married and have kids while still poor and jobless, so that Andrew could pursue his vocation as a theologian) and we, like the Stewarts, haven't looked back. Like them, we have experienced that when you trust God (even if it seems crazy to do so) there is so much peace and joy that follows. It isn't easy, but that peace makes a world of difference. In our case, trusting in God to provide led us to a seminary - a community that has become like another family to us. In Haley's case, trusting in God led them to a farm - and a community that has become like another family to them. I love, love, love Haley's descriptions of the farm. I love the community she describes, and the simplicity. It reminds me so much of our life as a family. And that's what is so beautiful. Sin is boring, but holiness is interesting. There are only a certain number of ways to sin, but there are so, so many ways to be holy. I love to hear people's vocation's story; to hear how God has prompted them to follow His call in their own lives. Like in the stories from the lives of the saints, it never ceases to amaze me how God is at work in so many people's lives - and in such different ways. It gives me hope, and courage, to live out my own vocation. 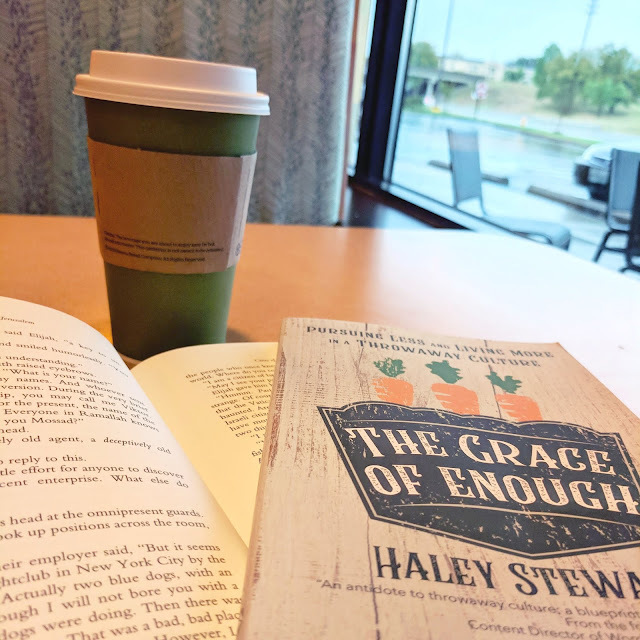 Reading Haley's story gives me that kind of hope and encouragement. Do crazy things for God, and you won't be disappointed, is the underlying message! But more than just affirming things I already know, The Grace of Enough has been challenging me. Our bedroom closet has been a disaster for years. There was so much stuff I was hanging on to "just in case" I needed it down the line. But instead of using all that fabric and yarn and other various art supplies and ill-fitted clothing...it was just stressing me out. I would open the closet door and be overwhelmed by so much stuff. But, without realizing it, I was afraid to let it go. Guys, I cleaned out that closet. I let go of so much stuff that I had been desperately hanging on to. And do you know what? I feel free. I'm in the midst of an ongoing letting go of things (something that I've done before, but still need to do periodically), and I feel like this book is helping to refocus my heart. It isn't just about decluttering and being tidy. It's about being a good steward of the things that God has given me. It's about doing everything - even de-cluttering - with love. Thanks for the chance to be a part of the book tour, Haley! Click here to see a list of all of the stops.